Digital transformation in process operations requires seamless and secure connectivity between the device and the enterprise. 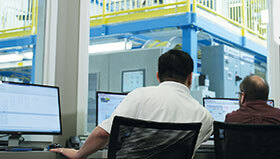 The PlantPAx distributed control system from Rockwell Automation has long helped make this connectivity possible through its alignment with plant-wide automation technology and use of open communication standards. Now, Rockwell Automation is revealing new enhancements coming to the platform to help process operations capture more value across the entire plant and enterprise. The next PlantPAx DCS release will help users reduce unplanned downtime and improve system availability. This includes support for parallel redundancy protocol (PRP), an industry standard for redundant Ethernet, enabling more secure controller and I/O communications. The next release will also feature updated HMI and trending tools to help increase productivity, and improve effectiveness of operations and maintenance functions. This includes an enhanced Library of Process Objects to align with industry display design standards. The expanded library also includes intuitive integration with electrical protection devices, leveraging both Ethernet/IP and IEC-61850 communication standards. This further extends plant-wide control capabilities and connects electrical management and control, reducing infrastructure duplication resulting in easier implementation and lower total cost of ownership.